Cruiser. Sank on 31 May 1916 at the Battle of Jutland Battle of Jutland. 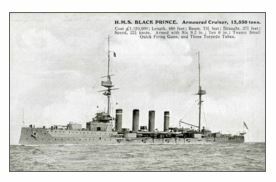 Becoming separated from the rest of the British Fleet, she was engaged by up to six German ships, including four Battleships, and was hit by at least twelve heavy shells and several smaller ones. She sank within 15 minutes, with no survivors from her crew of 857 men.